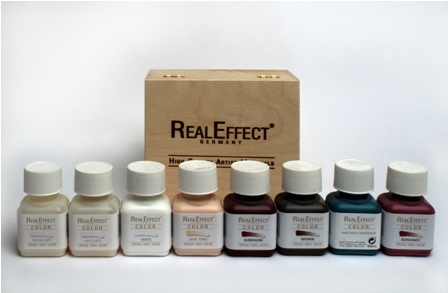 9831 - Real Effect Color SET 9x40ml. We have designed this set to pass wondefully to the Real Effect kits. It also works well on the Berenguer Vinyl as used in some of our DVDs. Nicole has pu this package together out of all of the colours that you normally need to paint a doll. - For the skin layers use 1 part Skin 2 and 1 part nails white mixed. - For the second red effect use 4 parts Aubergine and 1 part brown. Photo 2 shows the before and after effect. 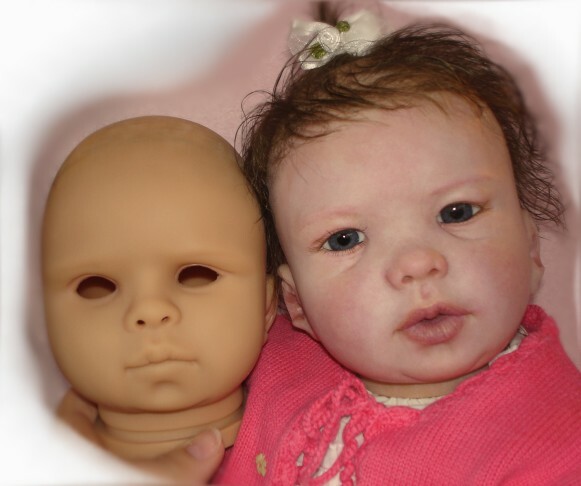 These were dolls from Katja Schneider and Ruth Kunz. Although they are two different models, both have the sam vinyl colour tone. The covering capability is shown nicely. As the first in the Reborn market in Germany, we offer you this special water based soft PVC (Vinyl) paint.In contrast to the other paints on the market, this paint has no softener reactant product in it. That means that the softner in the vinyl doesnt get attacked or react with the paint. The paints have this special characteristic and also have colour pigments in it. This normally increases the cost of the paint enormously. In order to develop this paint we have worked with many industrial paint producers. The majority of the paints on the market are solvent based, but this was not an option for us as we didnt want to expose our artists to the negative effects of these solvents. So we decided to go for a water based system. After our tests we sent the paint to the the labs at the paint producers so that they could tune it up a little! We then got a paint that was non toxic, and they inhanced the matt effect, also we could lengthen the time that you can work on it without it drying. We also consultated with Petra Seiffert and Nicole Middendorf so that we could get specific paint colours for the selection. Our paint will be able to increase the long term quality of the babies. - EU regulation EN 71 part 3 for toys compatability, even after drying! - Amazing UV light durability, doesnt fade. - Specialist "Real Effect" mixed Matt and Gloss tones. - Dries with a high quality matt effect. To increase the drying times the paint can withstand 3 hours in a 50 degree celcius oven.